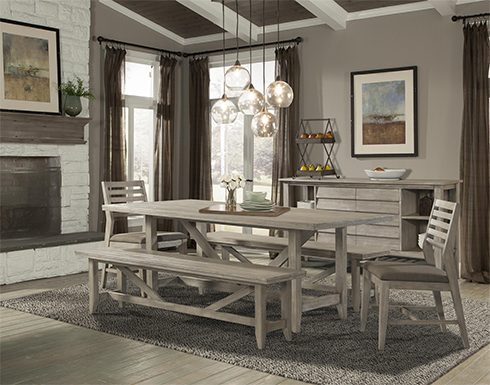 Say hello to our newest dining room introduction at Belfort Furniture! Corliss Landing features a weathered, driftwood grey finish that instantly brings a rustic feel to your master suite or guest bedroom. Crafted from responsibly harvested solid Acacia, you'll feel confident when purchasing this new collection. The contemporary trestle dining table can easily be dressed up or down to meet your style preferences. In this neutral driftwood finish, the entire Corliss Landing Collection can fit into any home decor. Measuring 79 inches in length, this dining room table will fill a dining room without over powering. 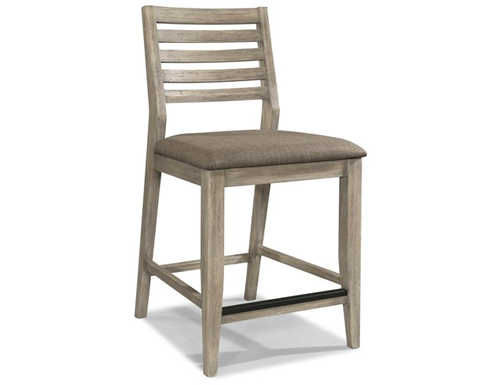 Corliss Landing's dining side chairs feature an upholstered seat for a comfortable dinner with friends and family. Mix things up by adding the dining bench to one side of the table. With a matching trestle base, the dining bench easily seats two to three! There's also an accompanying counter height stool in for any nearby kitchen islands or breakfast bars! Complete your dining room with the weathered sideboard. Featuring two drawers and two doors with adjustable shelving, there's plenty of storage in this piece! The unique design features four open shelves, perfect for displaying your favorite serving pieces. Fill the top with your freshly made goodies for a perfect serving buffet for your next gathering! With clean lines and a contemporary finish, this dining collection is a great look that's on trend for home design. For more dining room and entertaining inspiration, visit Belfort Furniture! Conveniently located in Dulles Virginia, Belfort Park features over 100,000 square feet of showroom space, spread throughout four unique buildings. Filled with hundreds of room settings you'll find something to inspire you!